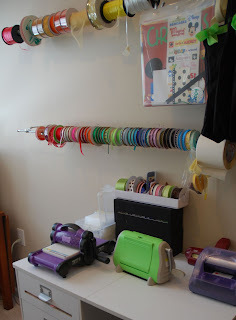 Monday ... first Monday of the month ... it's the day I've set aside (yeah, right) to try to get organized in The Paper Jungle, my upstairs loft that I'm commandeered as my own crafting area. The area is not the best to craft in. First, it's carpeted so it snags up all of those little "snivels" of paper. 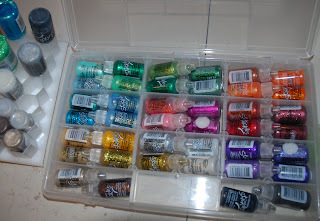 Second, it's the only place I have to store or use the Oriental rug so if I drop something like an embellishment or piece of paper I need, it's tough to find. And clean. And finally, the furniture is not the ideal -- a mish-mash of stuff that's been handed down from one house, a living room, a bedroom, wherever. 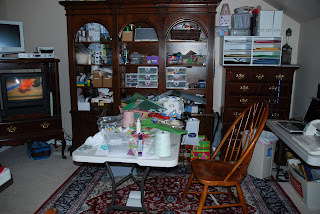 So today, I'll show you some of the "before" pictures, and some of the organizational ideas I have going into this month. Work desk a mess! 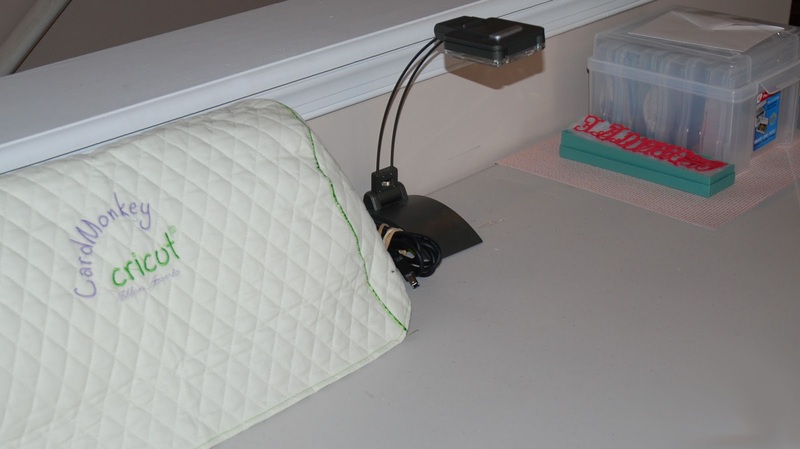 Cricut on the desk behind my chair. At least I face the TV and get easily distracted. one of two of my computer work stations up in The Paper Jungle. Best part is looking out the window! 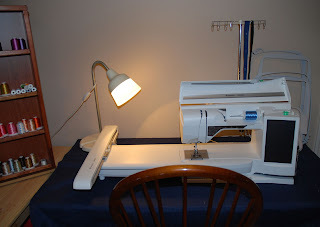 My third work table, 2nd Cricut. awaiting either a card or layout. The rail (top) leads downstairs. 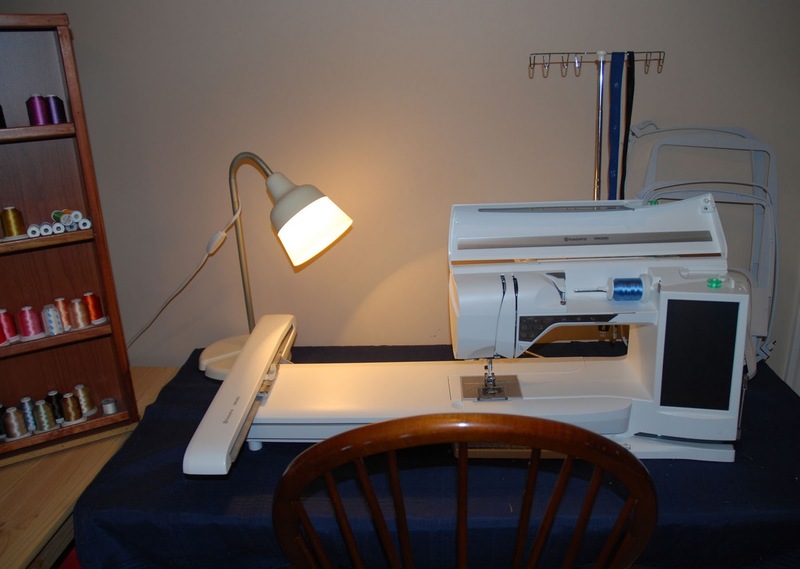 Viking Diamond Husqvarna sewing/embroidery machine. from a shop going out of business, $20. ribbons and clipped-up layouts, etc. 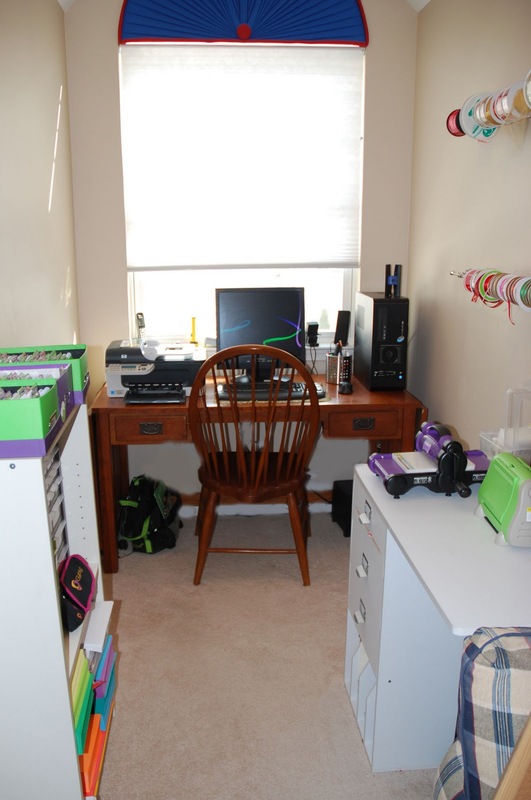 The desk in front was purchased at Michaels. holds all sorts of other tools and supplies. Cricut cartridges, in alphabetical order and labeled. SO much space and I hated wasting time between cartridges. I've organized brads, buttons, beads and such in old pill bottles. collection of Cri-Kits and other pens that I use in my Cricut Expression. 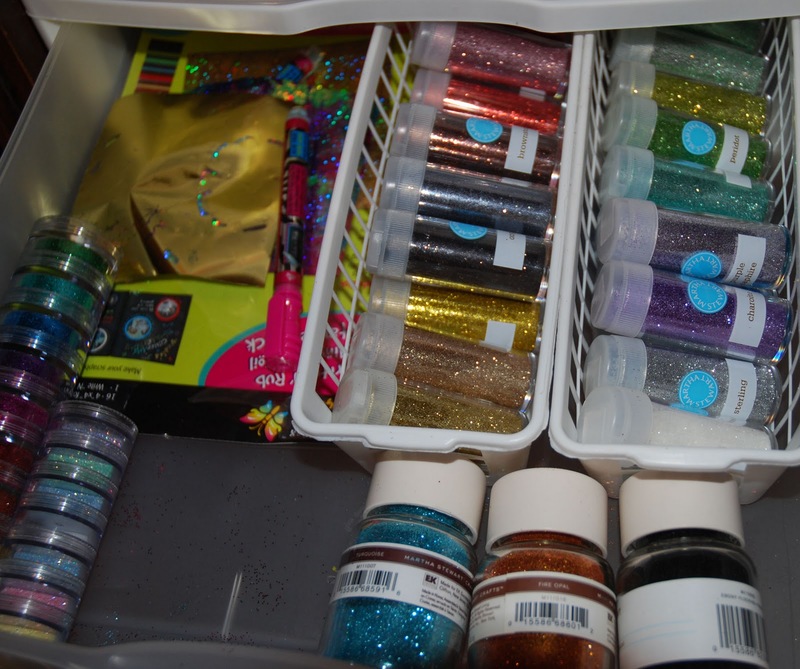 Glitter organized in another drawer. when not in use, to prevent clogging or air bubbles. 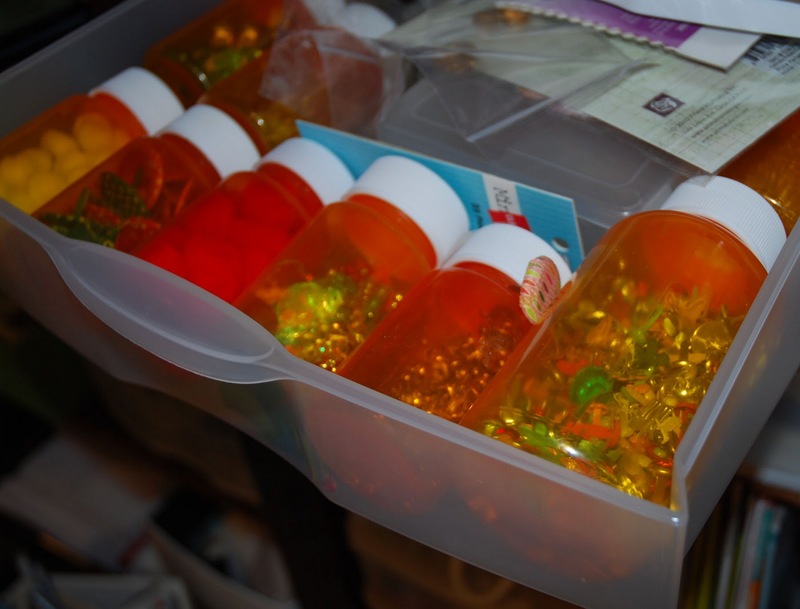 Convention, which allows you to store Stickles upside down. For me, when I want to hang my Stickles upside down, I use Velcro. Put the SOFT part on the bottle -- a little circle of it is all you need. they're in use or storage. tools that I like to keep nearby. 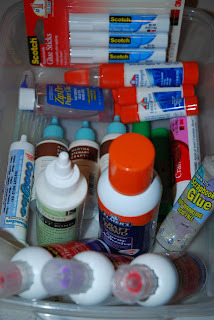 Can you tell I can't decide which glue I like best? I hope you liked this little tour of the mess upstairs. If I survive cleaning day in The Paper Jungle, check back for the "after" pictures! What a great space Ellen! Looks like you've already been hard at work in there! I love all your organizational solutions! Wow, you have been busy! 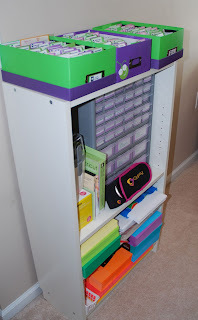 I like all your organizational ideas~I am going to do what you did and get in my room and get organized!!! Love what you did with your stickles...gonna do that~great idea! Thanks!! You have some great organizational ideas! My room is teeny tiny so I am forced to pick-up often which I guess is a good thing. 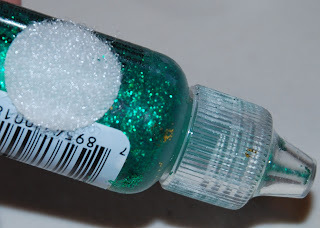 I have a question about your homemade glue dots. Are they 'Permanent' or 'Repositionable' especially the ones with the Alene's Tack it Over & Over? Thanks. You say mismatched furniture, I say gorgeous display cabinet. You say its not a great space, I say its huge (compared to mine). I love seeing people's areas. Thanks for sharing! 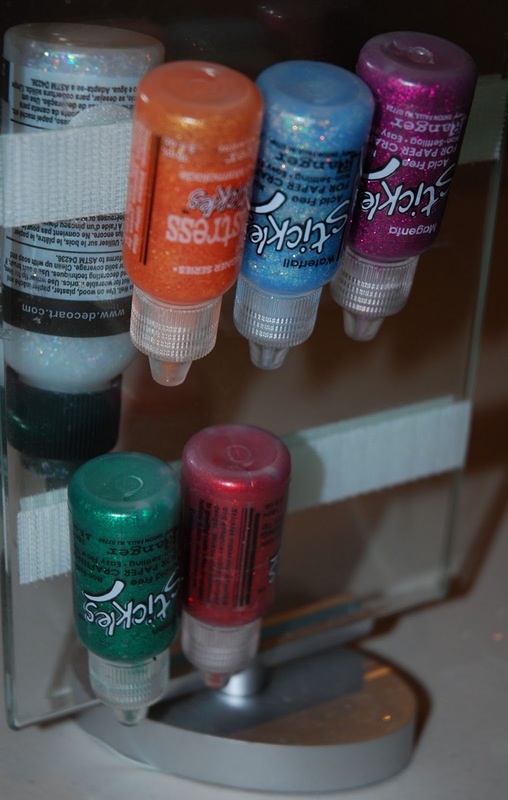 Love the velcro idea for the stickles. I love the before pictures. I think I spend as much time organizing my space as actually scrapping! I agree your space looks amazing although I do feel for you about the carpet. My space is a 5' X 5' closet so I need to clean up after every project. 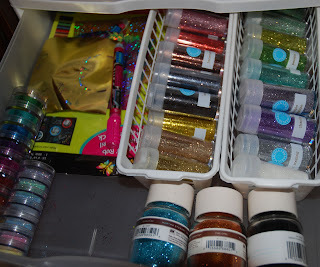 Seems every time I go to the craft store I need to reorganize in order to make room for what I bought. wow you have a big scraproom. I wish i had the space you have. I have an award for you on my blog. Ummm, I think I need to invite you to the Casa de Bermudez for assistance in my craft cave. So how can I bribe..... er entice you to come for a scrappingly good weekend. 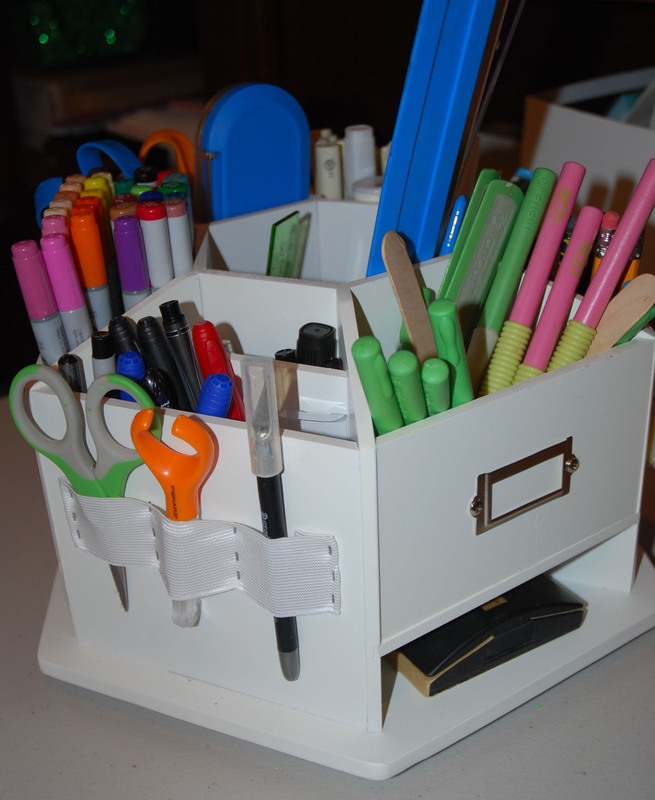 Your organizational skills are astounding! TFS. I love your customized Cricut cover! Now that I see your space I really want to come and play in the loft with you!